Intercalation of various atoms and molecules into layered materials is one of the extensively used routes for obtaining novel properties. Graphite is certainly a material which is often the subject of this kind of research, and there is a whole series of other materials such as Cu- and Fe-based superconductors, 3D topological insulators, white graphite (hBN), transition metal dichalcogenides (MoS2, WS2) and others. Intercalation of epitaxial graphene, i.e., insertion of atoms or molecules between the graphene and its substrate is one of the commonly exploited ways to obtain modified graphene systems with new properties. Via intercalation, one can modify the strength of the graphene-substrate bonding or regulate electron or hole doping of graphene. In addition, the interaction of graphene with its surroundings can be directly influenced by such chemical modifications. From technological point of view, good understanding and the ability to control the intercalation process is of exceptional importance, e.g. for the optimal design of modern batteries and supercapacitors. Despite all this, details of the intercalation mechanism of epitaxial graphene are still unclear. In the paper „The mechanism of caesium intercalation of graphene“, which in a large part contains results obtained through the UKF project "Photolithographic synthesis and electronic properties of graphene based devices and related structures", a detailed characterization of caesium intercalation of graphene on Ir(111) is presented. Information which clarify how and where does the penetration of caesium atoms through the graphene occur is obtained by utilizing several experimental techniques (LEEM, STM, ARPES, LEED) as well as by theoretical calculations (vdW-DFT). It is shown that in the process of intercalation the system exhibits phase separation of caesium atoms into a dilute adsorbed and a dense intercalated phase (Fig. 1). Effects of such phase separation are also visible in the photoemission spectra in the form of the inhomogeneous electron doping of graphene (Fig. 2). Results show that the van der Waals interaction plays a key role and, depending on the concentration of the caesium atoms, allows or blocks intercalation and also inhibits complete desorption of the intercalated caesium atoms. Microscopically, intercalation dynamics is governed by graphene wrinkles and substrate steps, structures which are intrinsic to epitaxial graphene systems. Figure 1. Graphene on Ir(111) partially intercalated with caesium as seen by (a) STM and (b) LEEM technique. Phase separation to dilute adsorbed (alpha) and dense intercalated (gamma) phase is evident. Figure 2. 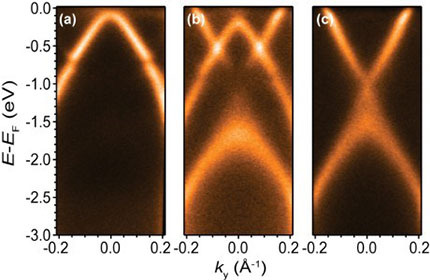 Photoemission spectra of graphene intercalation with caesium recorded for various amount of deposited caesium: (a) pristine graphene, (b) partial intercalation and (c) full intercalation.